If you could reduce your monthly electrical bill, wouldn’t you want to? There is little doubt that any homeowner wouldn’t want to lower their monthly energy bill, especially if doing so involved very little effort on their part. The green and eco-conscious movement continues to change the way people choose to live. We recycle more, we try to buy from eco-friendly brands, and many companies also are giving up on old traditional manufacturing methods for more sustainable ones. Green homes are more popular than ever and many homeowners are eager to add green features to their, both to help the environment as well as reduce their energy consumption. There are a lot of ways you can lower your energy bill, yet one option that many homeowners forget about it their roof. Considering that the roof is often the most exposed to the elements and significant part of the home’s overall structure, it’s surprising that reducing energy consumption isn’t a more common factor in choosing a new roof. If you’ve been considering a restoration or getting a new roof, here are 3 design ideas that will make a positive impact on your monthly utility bill. One of the most obvious ways of reducing your energy bill is to reduce cooling needs. The roof on your home is going to be taking the brunt of the sun’s heat on a daily basis, so it is important to focus on this issue first. It’s common sense to anyone that has worn dark clothes in the summertime that dark clothes just make you feel hotter than light colored clothes. This is due to dark colors being apt to absorbing heat whereas light colors reflect heat. The same idea applies to your roof. Black, asphalt gray, and other dark colors are very popular for roofs, but may not be the best choice when it comes to cooling. Instead of going with these traditional colors, look into lighter shades instead. Shades of lighter grey, whites, and even terracotta reds are all much better choices. Depending on what material of roof you choose, you could have quite a wide range of lighter colors to shop from. On average a black asphalt shingle roof can reach temperatures of 150F or more. Choosing a lighter colored roof color can cut close to half in some situations. While not exactly the roof itself, even a beautifully energy-efficient cool roof can only do so much if the attic insulation is in bad shape. Attic spaces that aren’t being actively used often are ignored completely, yet this insulation (or lack of) can let in a surprising amount of heat or cold. Having a professional contractor inspect your attic space and the insulation is a must. Older homes are more liking to have poor insulation, but even newer homes could have issues if moisture has infiltrated the attic. Moisture can quickly cause insulation to compact and breakdown, sometimes leaving completely unprotected areas between the roof and attic. If you’re having an entirely new roof installed is it prime opportunity to ensure that the inside of the roof and the attic are heavily insulated. If you happen to use your attic for storage or some other use, having this improved insulation means this room will have a more stable temperature and will maintain AC or heating far better. While using cooling roof coatings and fixing the insulation can all be done on existing roofs sometimes your contractor may find that a simple repair isn’t possible and an entire replacement is needed. In this situation it is a prime opportunity to select a more sustainable roofing material. Roof material sustainability comes down to two major factors – whether the material is sustainably manufactured and whether the material will have a long lifespan (longer lifespan = overall less material waste during the life of the home). Overall most of the biggest roof shingle companies use sustainable means of shingle manufacturing, though it can be worth it to inquire as to whether cedar shingles are from new growth, well-managed woodlots. The more important factor is whether the material is suitable for your region and home’s location. Your roofing contractor is the best source of information to help you decide if the material you have in mind is a good choice for your home. The right roof that is properly maintained should last close to 35 years or more, which means less overall material used compared to roof that only lasts 15 or so. The roof of your home is an integral part of the lifespan of your house and has a significant effect on your utility bill when it comes to cooling and heating throughout the year. 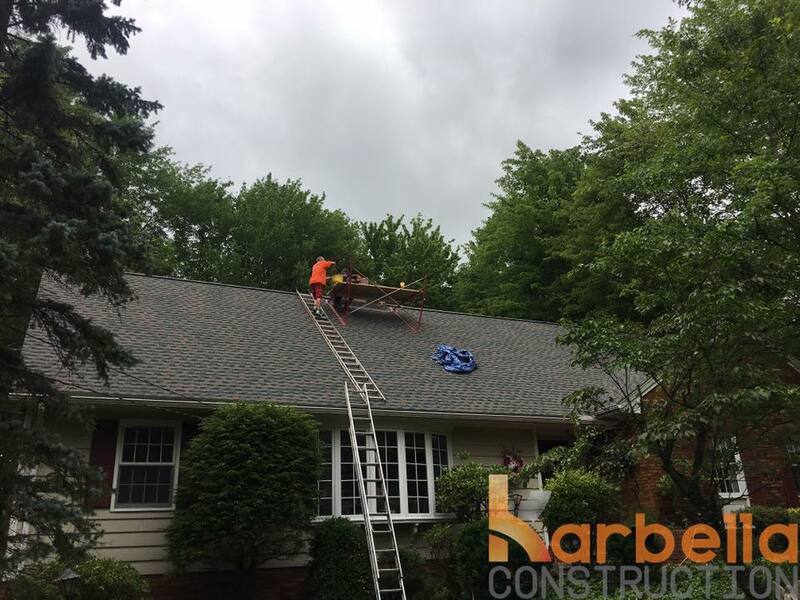 If you are looking into having a new roof installed or simply wish for an inspection to see where you roof and attic insulation can be improved, reach out to Karbella Construction for a consultation.